The result will encourage shareholders after a disappointing 2015 that saw the firm lose more than $8.0 billion in market value, with its smartphone business sandwiched by top-end rivals such as Apple's iPhone and lower-end devices from fast-growing Chinese outfits Huawei and Xiaomi. 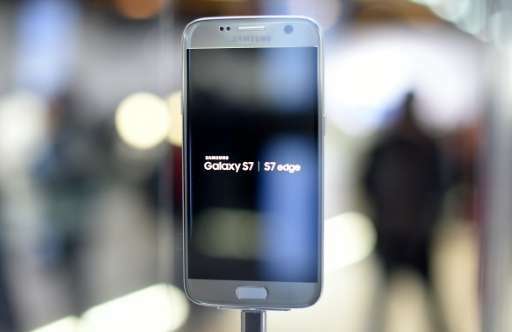 In an effort to defend its smartphone share, Samsung rolled out the latest version of its Galaxy S7 smartphone in March—ahead of new launches by its competitors. "Our earnings improved after we launched our latest flagship models, Galaxy S7 and Galaxy Edge on March 11, a month earlier than their predecessors," Lee Kyeong-Tae, the vice president of Samsung's mobile unit, said in a conference call. "The S7 and Edge are showing robust sales performance in regions including North America," Lee said. 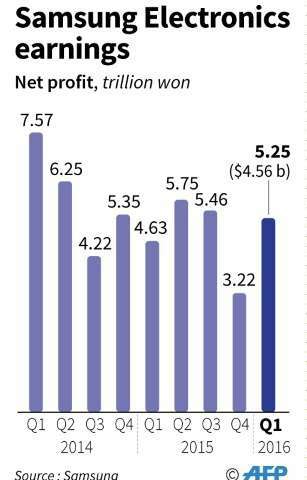 Samsung sold 92 million mobile phones in the first quarter, of which around 85 percent were smartphones, he added. Samsung's net income for January-March stood at 5.25 trillion won ($4.56 billion), up 13.4 percent from 4.63 trillion won in the same period last year. The first quarter figure was higher than the 4.42 trillion won average of estimates compiled by Bloomberg News. The company also said it would buy back 2.03 trillion won worth of common and preferred shares. Samsung's share price fell less than 1.0 percent in early trading Thursday and has gained about 3.0 percent this year following three straight annual declines. 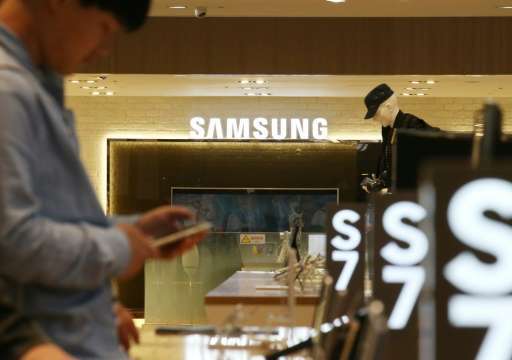 Samsung said a weakening Korean won against major currencies positively impacted operating profit in the first quarter to the tune of 400 billion won—reflected mainly in component business earnings. Apple reported net income of $10.5 billion in the fiscal quarter to March 26, down from $13.6 billion last year. The performance of the Galaxy S7 pushed the mobile division back up to top spot as Samsung's largest earnings source. In recent quarters that position had been taken by the conglomerate's chip business, which had picked up the slack when the once all-conquering mobile unit started to flag. As well as providing the chips for the company's own handsets, Samsung's semiconductor unit also makes the processors for a number of other companies—including Apple. "In the second quarter, the company expects its solid performance to continue, led by steady earnings in the mobile and semiconductor businesses," Samsung said. Sales revenue for the first quarter stood at 49.78 trillion won, an increase of 5.7 percent from a year ago, while operating profit was up 12 percent at 6.68 trillion won. Despite "weak" seasonal demand for memory chips, Samsung said its semiconductor unit managed to achieve solid earnings by expanding sales of high value-added products. 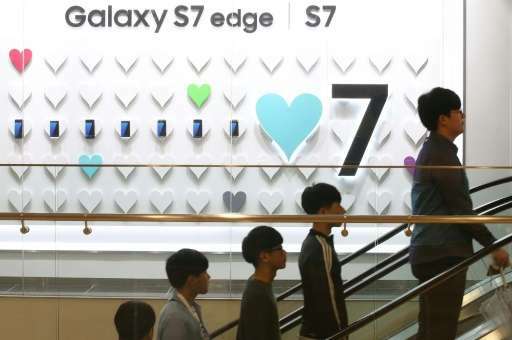 The only trouble spot was the company's display panel unit, which reported an operating loss of 270 billion won for the quarter, compared with a profit of 520 billion won a year earlier. Samsung attributed the downturn to a sharp decline in LCD panel earnings, and warned that the LCD market would "continue to be over-supplied" for the rest of 2016. Samsung kept its number one spot with a market share of 24.5 percent, while Apple stayed at number two with 15.3 percent, ahead of Huawei's 8.2 percent.